I didn't really eat much outside of some cucumber for lunch and as the afternoon wore on I became hungrier and hungrier. After finally getting home the prospect of cooking dinner seemed like too much effort and Chris wasn't really hungry. 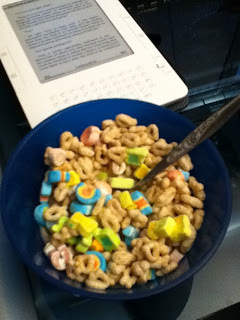 That meant devouring a few bowls of cereal and reading some of my book! In retrospect, may have ate too much. ugh.